Firestorm is the name of several fictional superheroes appearing in American comic books published by DC Comics. 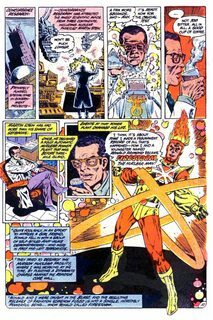 Ronnie Raymond and Martin Stein debuted as the first incarnation in Firestorm, the Nuclear Man No. 1 (March 1978) and was created by Gerry Conway and Al Milgrom. Ronnie Raymond (by himself as the second incarnation) debuted in Firestorm the Nuclear Man vol. 2 No. 100 (August 1990), and was created by John Ostrander and Tom Mandrake. Jason Rusch (as the third incarnation) debuted in Firestorm vol. 3 No. 1, (July 2004), and was created by Dan Jolley and Chris Cross.